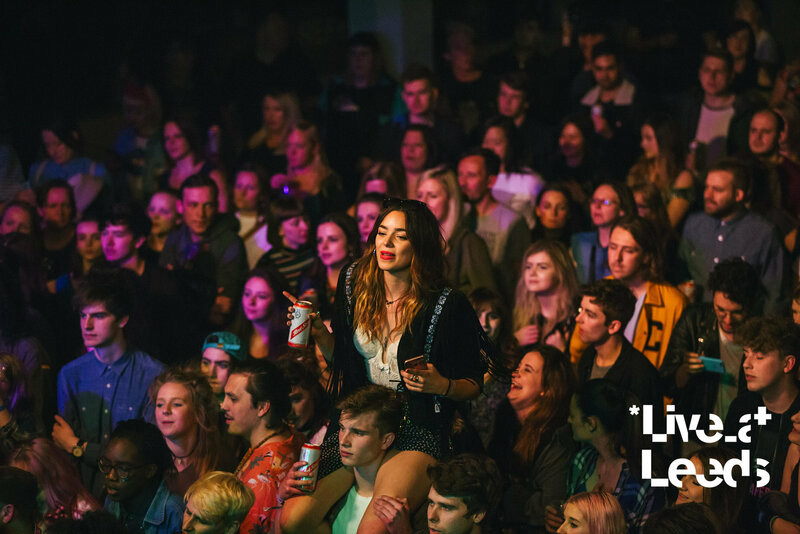 Live At Leeds is the North’s award-winning metropolitan festival for new music and the organisers pulled out all of the stops for another successful year. With far too many incredible acts to try and catch over the course of one day, there are always going to be a number of brutal clashes and this year was no exception. Starting the day at Brudenell Social Club, northern trio Lisbon took to the stage of the venue’s games room on the DIY NEU stage to warm up the punters nicely. Fresh from a brief hiatus and with new tunes to boot, they sound massive on ‘Tyler’ and evoke a colourful response from the crowd before them. Frontman Joe requests a snap of the packed out room, telling the audience it’s “to show my Mam people actually turned up”. A quick sprint over to Nation of Shopkeepers and Brighton-based five-piece MarthaGunn are on stage and ready to soar. Abi Woodman’s ethereal vocals fill the intimate space beautifully as the band launch into ‘Honest’ and ‘Honey, Let Me Go’. Their lesser-known and currently unreleased material is a strong testament to the strength of their musical capabilities too. Next up is London four-piece JUDAS, who receive a superstar’s welcome as they take to the stage. The crowd stretches out of the venue and winds round the street outside too. Their set is short but sweet and sees them blast through the hits whilst sounding as stadium-ready as ever. Nation of Shopkeepers is far too small a venue to cope with the excessive amount of energy that the punchy group contain – much bigger venues await JUDAS. Heading over to the impressive O2 Academy and the queue snakes around the building and then some for Black Honey. When we finally reach the front and are let in, the atmosphere inside is fizzing with excitement and anticipation for the Brighton group to give it their all. Drawing in a demographic of all ages, their live show is as thrilling as ever and they make a tough act for headliners Slaves to follow later on in the day. After a brisk walk over to Leeds University, it’s a short wait before Fickle Friends come on but we are pumped. The five-piece hail from Brighton (we have so much talent down here, it’s not our fault!) and are one of the most exciting bands around at the moment, they’re not exactly new as they’ve been going for quite a while but it’s only recently they’ve piqued the attention of the mainstream. 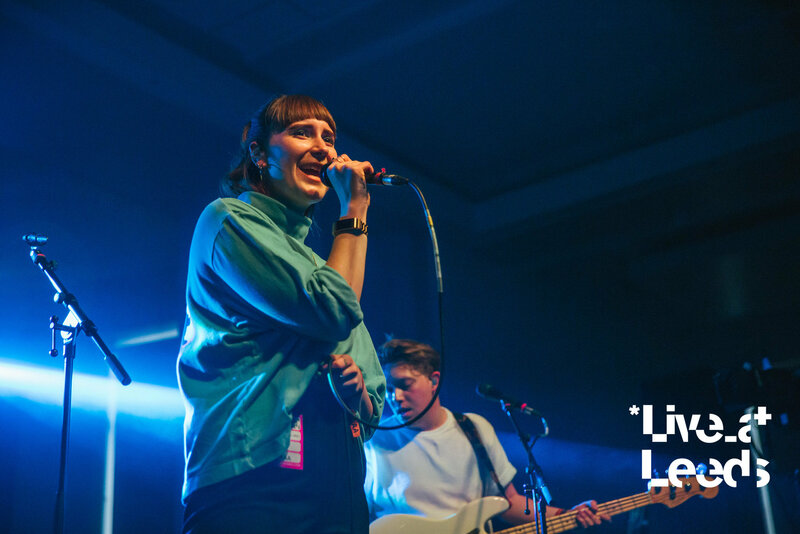 Giving us plenty of 80s vibes and noise that’s enough to convert even the most disinterested of audiences, Fickle Friends appear on stage and spend 45 minutes consistently blowing everyone in the room away. Front gal Natti announces the show is a special one as they’re going to be testing out a few new tracks from their upcoming debut album. It might have been tricky to catch the names of the new numbers but, rest assured, fans will have no trouble in falling for new material like they have with the band’s previous hits. 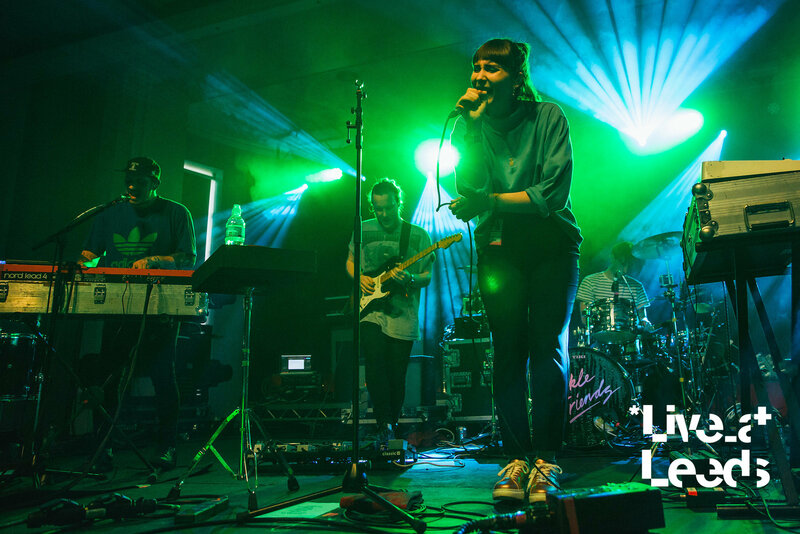 Fickle Friends undoubtedly provide the ultimate shindig of the all-dayer and dazzle the University venue with slick hits such as ‘Hello Hello’, ‘Cry Baby’ and ‘Brooklyn’. 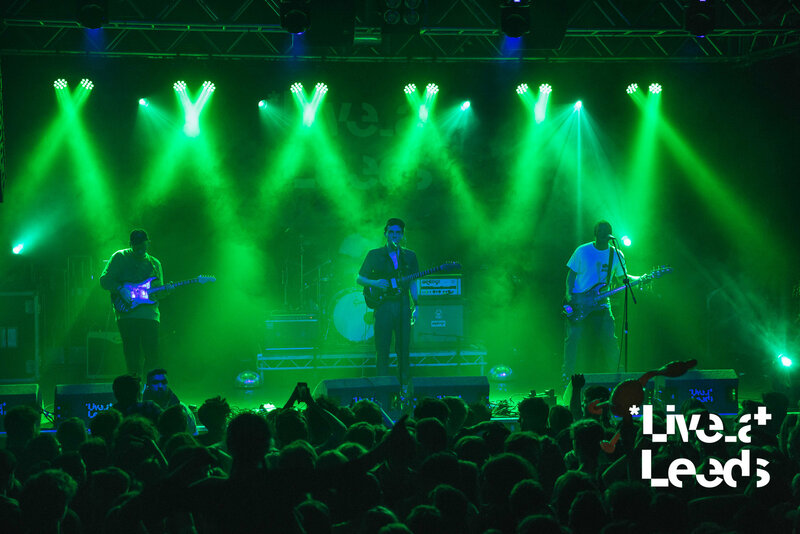 An incredible live act time and time again, they’re fast becoming the indie-pop wonder group they’ve always dreamed of. Next door at Leeds University Stylus, JAWS play a blistering set that brims with tracks from their recently-released second album, ‘Simplicity’. The group revel in every moment of their set and the crowd swells as each number progresses. It may well have been one of the last chances to catch them on tour for a while, as they’re now heading back to the studio to write album number three. Before we know it’s time to head over to Brudenell Social Club once again, this time for The Big Moon’s late night set. Having unleashed their debut album only a mere three weeks ago, the band are at an all time high in their careers and what follows at the show is absolute carnage. Whilst Brudenell seemed like an odd choice for them to perform in, due to it’s restrictive size, the band take it in their stride and conquer their performance thoroughly. All their usual anthemic hits were played in full, including ‘Sucker’, ‘Cupid’ and ‘Formidable’. The band’s take on Madonna’s ‘Beautiful Stranger’ was a particular highlight that stood tall alongside their new tune ‘Bonfire’ that saw plenty of audience participation. As they reached the final couple of tunes, a few overexcited lads jumped on stage to join the band and elation ran extremely high from the band and their adoring crowd. You get the feeling with The Big Moon that they can’t quite believe their luck at having become so successful but it’s more than deserved. As they ripped Brudenell Social Club limb from limb, there’s no denying the painfully bright future The Big Moon have set out for them. Let’s hope next year’s Live At Leeds delivers as many electric performances as 2017’s event did.